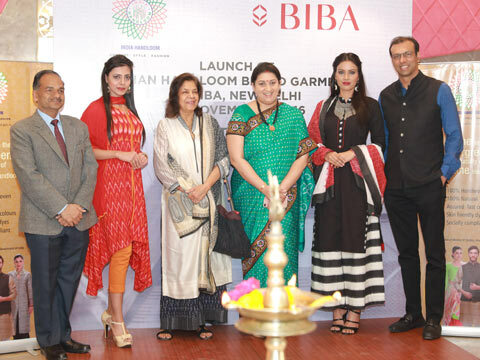 BIBA, the ethnic apparel brand has joined hands with the Ministry of Textiles, Government of India and announced the launch of India Handloom Brand garments at BIBA’s flagship Lajpat Nagar store on November 07, 2016. The India Handloom Brand launched on August 07, 2015 is an initiative by the Government of India to promote the branding of high quality handloom products with zero defects and zero effect on the environment. Smt. Smriti Zubin Irani,Hon’ble Minister of Textiles, Government of Indiagraced the occasion by lighting the auspicious ceremonial diya, present at the occasion also were Mr. Alok Kumar, Development Commissioner (Handlooms), Ministry of Textiles, Government of India, Ms. Meena Bindra, Chairperson, BIBA and Mr. Siddhartha Bindra, Managing Director, BIBA. The event marked the collaboration between India’s leading pan India ethnic brand BIBA and Ministry of Textiles, Government of India which would entail BIBA to create apparels using the India Handloom Brand fabric promoted by the Ministry of Textiles. To start with, the clothing line would comprise of India Handloom Brand Pochampally Ikkat fabrics from Telangana State and would be available at key BIBA outlets. BIBA, Indias leading and most loved ethnic wear through this initiative will promote India Handloom Brand fabric at their stores. The new Spring Summer Collection will have pieces with an additional tag of ‘India Handloom Brand’ to certify that the product is made using the quality fabric. BIBA, being a home grown fashionable ethnic wear brand always has the prime objective of providing trend setting Indian attire to the customers. This initiative will provide BIBA an opportunity to popularize Indian handloom products which will in turn help the weavers and local artisans’ showcase their works on a wider platform and help provide a fashionable outlook to the product.